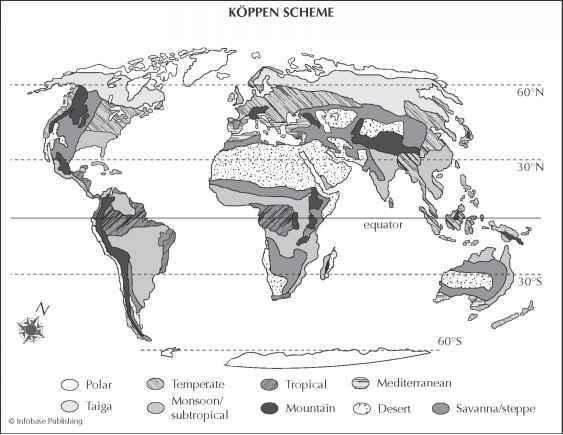 This illustration of Koppen's climate classification scheme shows the primary climate types found around the world. just as critical to vegetation as the averages. Wind is another weather factor that affects vegetation and yet does not appear in the classification scheme. Critics also pointed out that vegetation boundaries and climate boundaries are not always the same, making it difficult to determine where one climate type stops and another begins. Despite these issues, currently used climate schemes are almost exclusively revisions of the original Koppen classification scheme. During this same period, the American geographer C. W. Thornthwaite (1899-1963) expanded on the relationship between vegetation and climate by analyzing the movement of moisture from the soil into the atmosphere by either direct evaporation or passage through the leaves of plants (evapotranspiration) and by measures of soil moisture. His work extended the applicability of climatological studies to agriculture but was so complex that it did not gain the wide following of the Koppen scheme. 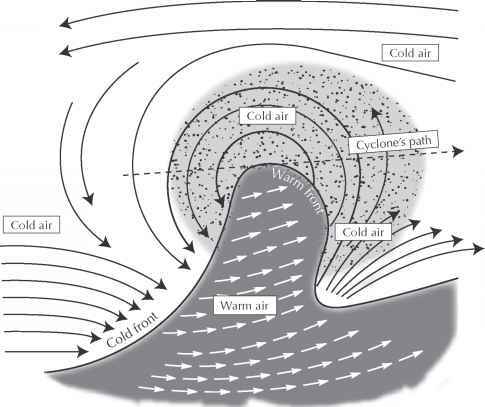 The most commonly used Koppen-based scheme in use today is that presented by the biogeographers Glenn T. Trewatha (1896-1984) and Lyle H. Horn (1924-89) in their book An Introduction to Climate. They use seven climate groups, instead of Koppen's five. Added were a boreal climate group—a climate zone that only exists in the Northern Hemisphere between 50°N or 55°N and 65°N latitude—and a highland climate group, which acknowledges that higher-elevation areas in different climate groups have more in common with each other than with the lowland areas surrounding them. This climate scheme appears in the accompanying illustration. Although climatology studies were only tangentially related to weather prediction, the knowledge of climate types was used by architects and engineers to build the most suitable, safe structures for a geographical area; by agricultural experts to recommend appropriate crops for the greatest farming success; and by water managers to make informed decisions about proper water systems to support resident populations in their areas. Regional climate studies were also important to countries such as Great Britain, France, Germany, and the United States that controlled far-flung territories as they considered the health implications of climate for their transplanted citizens sent to oversee their empires. As important as the climate classifications of the 1930s were, they would neither meet the needs of the worldwide military effort expended during World War II nor address the issue of climate change. 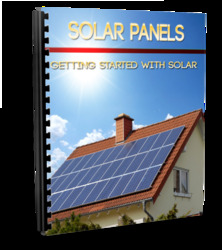 Those developments would await the transformation of climatology from a geographical endeavor to a physical science undertaking.